For many walkers and joggers, sidewalks provide a safe, convenient way to get from one place to another. However, for people with disabilities, navigating sidewalks can be a challenge. Eric Sinagra, A'11, has made sidewalks the focus of his research and career, starting a company centered on improving the conditions of sidewalks. The company, pathVu, is still in its infancy, but Sinagra and his partners have plans to use the company's proprietary technology to help cities and municipalities identify problems with sidewalks and improve safety for everyone. "We focus on people with a disability, older adults, but it applies to everyone," says Sinagra. One of the goals of pathVu is to create a navigation tool that directs pedestrians along the most direct route with the least amount of challenges. The company uses technology- a manually-propelled computer on wheels with sensors that collect GPS data and detect surface roughness, slope and tripping hazards-developed by Sinagra as part of his master's thesis to investigate how rough sidewalks affect wheelchair users. Because Sinagra and his partners can't physically walk every sidewalk in every town or city, pathVu also relies on people submitting information about sidewalk conditions. The information collected is used to help build a database accessed by pathVu's app, which allows users to take pictures of a problem and instantly upload them. Sinagra hopes his company can help cities, municipalities and organizations understand sidewalk problems and prioritize improvements. Singara was inspired to become an entrepreneur by his brother Nick, A'06, GA'08, who also started a company. Nick was also his inspiration in another very important way, as he uses a wheelchair. "Growing up with him got me interested in rehab and developing technology for people with disabilities," says Sinagra, who has seen firsthand how sidewalks can prove challenging for his brother. Singara notes that he tries to live Duquesne's mission through his work. "The mission says ‘Serving God by Serving Others' and that's essentially what we're trying to do with the company." The company's next steps are to keep improving its navigation tools, market its technology to potential customers and develop community partnerships. 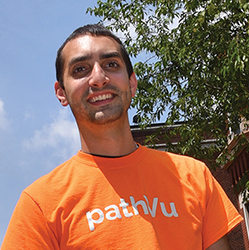 pathVu recently partnered with Duquesne's Office of Residence Life to introduce students to its app and recruit them to report on sidewalk conditions as they travel around Pittsburgh. Read the full story in the Fall 2016 issue of the Duquesne Magazine.